Exciting Melton footballer Ollie Burke has been making the headlines with several Premier League clubs reportedly interested in snapping up the Nottingham Forest winger. Burke has scored three times already for Forest this season, including a brace in Saturday’s 4-3 win over Wigan, and scouts from Liverpool, Sunderland, Southampton, Crystal Palace and Leicester City are reported to have watched him this season. Arsenal are also said to be interested. The 19-year-old, who began his career with Mowbray Rangers, was last week named in Scotland’s squad for their opening World Cup qualifier in Malta, having already made two senior appearances for the national side. While only in his second full season of senior football, Burke’s potential has already seen him compared to some stellar names. Forest boss Phillipe Montanier said Burke could one day match French international forward Antoine Griezmann who came through the ranks under him at Real Sociedad. Burke’s team-mate Thomas Lam, meanwhile, went one step further and said the pacy winger had the potential to be as good as Real Madrid star Gareth Bale. 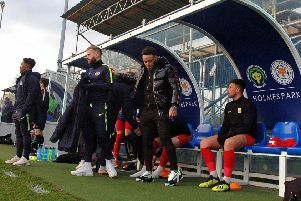 Montanier has encouraged the former John Ferneley College pupil to stay and continue his development at the City Ground. Burke feels tremendous loyalty to Forest, having spent the last decade at the club, and signed an improved four-and-a-half-year contract in February.